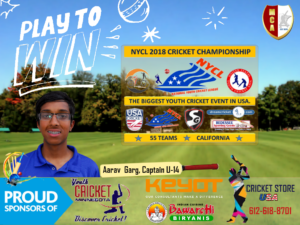 MCA (MYC) U14 team’s win vs. UCL in California! 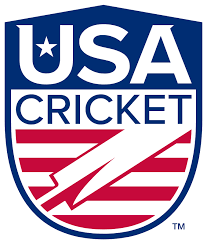 Congratulations Minnesota Youth Cricket (MCA) U14 team for their big win against United Cricket League (UCL) in National Youth Cricket League U14 national championship in Eastin ground, Union City, California. MCA U14 beat UCL by 85 runs! It was a woderful display of team effort! MCA scored 158 for 5 wickets in 20 overs (Rahul 30, Khilan 34, Anwar 18, Mrityunjaya 18). 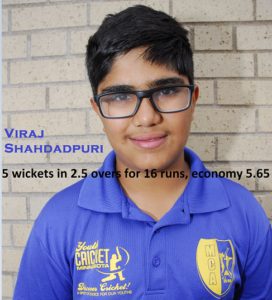 UCL was all out for 73 in 17.3 overs (Viraj 5 wickets in 2.5 overs, economy 5.65). Viraj Shahdadpuri was awarded the man of the match trophy! Congratulations Viraj! 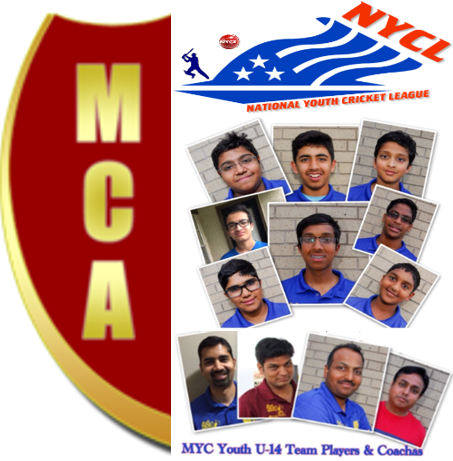 Congratulations MCA U14 Team, Coach Kishore Dasararaju and Coach Udai Dommaraju, congratulations captain Arnav Garg. Full Scorecard Link in NYCL Website.